God’s Goodness is not limited. God loves a cheerful heart, and He loves those who offer abundance, whether large or small. There is much to be shared~ for abundance is not withheld. Abundance can help multitudes! God knows what you need before you ask Him, he has supplied everyone abundantly and asks for us to be cheerful , be peaceful, be loving. For we all all heirs through Jesus. Jesus came so we can have life more abundantly. Abundance is not wrong, but is how God Creates. Love one another, and seek God with a sincere heart, in faith, knowing that God loves those who seek Him in Truth. In thanksgiving , offer thanks to God for all of His blessings, for He blesses abundantly, for generations, for family, for peace. Serve Him by using compassion, for those who use compassion will be rewarded, serve Him in gratitude, in alms giving and in love. Love is the highest gift, and unconditional love is what God loves. Forgiving one another as He forgives you. Loving one another as God loves you, for this is the way to serve and is blessed by the Most High. God loves honesty, sincerity, faith, love, peace, for He has created you in His Image, which is Love. Be bold in love, and serve Him in fortitude, for then you will create spiritual wealth, health of body, clean bill of health, friends who are loving, spiritual family and favor from the Most High. Live as you would if there were Heaven on earth. As if it is so. Imagine yourself with Heaven on earth. With Peace surrounding you, eternal peace. Would we not all be praising? Praise the Highest , for He is Good and His Goodness is without measure. Imagine yourself sitting in abundance, how does that feel? What does it look like? Are you financially secure, Are you peace filled? Are you in harmony? In love? Abundance Comes in many forms and to create it, imagine yourself as that , as abundant. As Blessed for that is what you are. Spend time asking the Angels of Abundance to help you with this meditation. 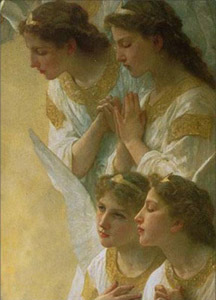 Ask the angels to surround you, filling your home, your vehicle, your office. Surrounding you and your family. Ask the Angels of Abundance to help you envision what abundance would look like. Know you are a child of God, and you are heirs, for there is plenty to go around for everyone. You are not taking from someone else when you create abundance, for you will have more to share with others. Do this often Child of God, and ask the angels to surround you and your home, envision what abundance feels like to you, what it looks like physically and you will manifest what you are thinking about more easily through envisioning. Listen for any guidance steps you receive from the angels and be thankful of everything you receive, every opportunity, every gift, little or big. Be grateful, for all comes from the Abundance of God. Do this often, it only takes a second to feel abundant, for you are abundantly blessed already.